A little while ago, Mumford and Sons announced a big outdoor show in Vancouver. Nothing unusual, but, It wasn’t in Deer Lake Park – an outdoor festival favorite, nor was it in the Malkin Bowl – nestled inside the gem that is Stanley Park. No, it was at Holland Park, an outdoor park in the heart of Surrey. Lots of folks balked at the fact that the show was in Surrey – see, it’s fashionable to hate on the city. It’s got a reputation it can’t shake, even if it’s no longer deserved. Holland Park is better known as a host of things like the Fusion Festival – an outdoor celebration of multiculturalism. Fusion festival what it has in fusion, lacks in ‘festival’, but, every park, and every city has to start somewhere. For the record, the Mumford and Sons show was a huge success – it was the biggest crowd they’d played to up to that point, and little to no issues. Mumford and Sons, of course are headlining Squamish Festival this year. All of that being said, it’s a hell of a coup by the folks at Blueprint and Live Nation, and by the City of Surrey to both land what they did in ‘Fvded in the park’ (FITP). There is a huge number of festivals every summer, so, there’s a ton of competition for big name acts. 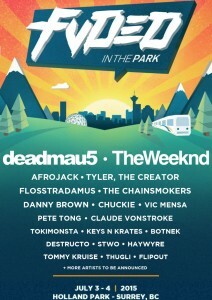 FITP taking place July 3-4 features two extremely successful headliners in Deadmau5 and The Weeknd. 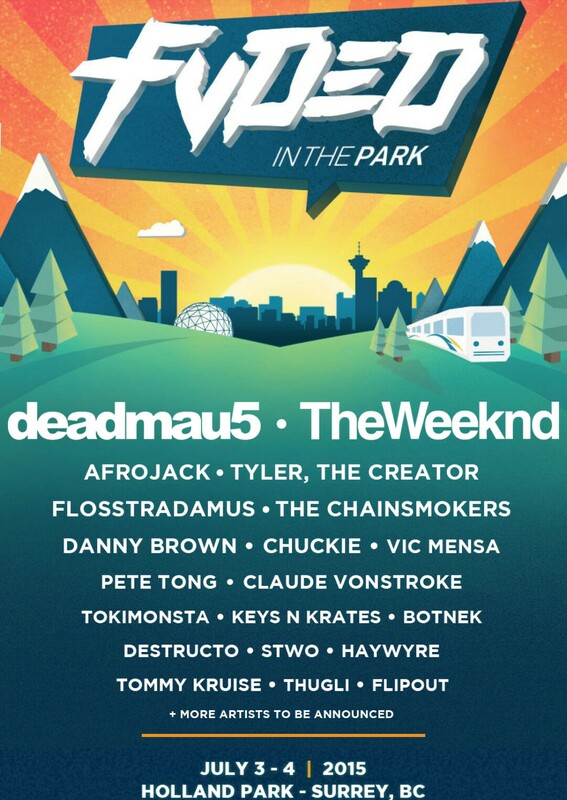 Deadmau5 was one of the headliners at Pemberton Festival last year, and The Weeknd is popping up everywhere you look – and for good reason. It doesn’t drop off there though, the lineup has a pretty solid middle tier. It’s got Afrojack, Tyler the Creator, Flosstradamus and many peoples favorite ‘indie’ rapper, Danny Brown. The festival will be seen as having a bona fide dance and rap roster. Rightfully so, a number of the artists are very ‘buzz worthy’. Its an all ages two day showing, with access to a very garden. More importantly it’s another big test for Surrey in proving itself as an entertainment destination. General admission tickets are an extremely reasonable $125 for the two days, and if you want access to the beer tents and some amenities, it’s $250. If you’re coming from downtown, it’s a quick train ride in and out of town, or you can spend the night at that ‘Fraser Valley’ friends place.